All transactions are safe and secure with a reliable history in online purchasing behind each of our associates. 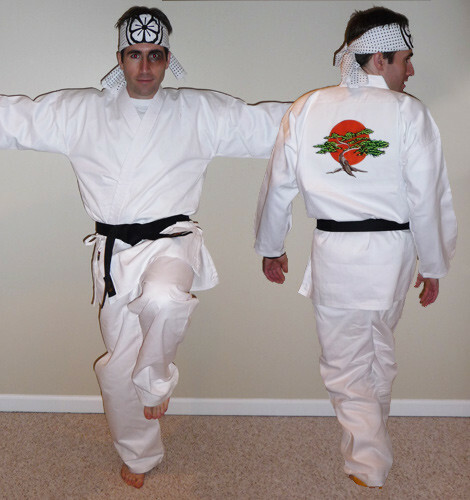 Buy the Karate Kid Costume Gi to own Karate Kid clothing and merchandise. This official Daniel LaRusso Karate Kid costume gi is your outfit for the All Valley Karate Tournament. The gi was designed by studying screenshots from the movie that showed the original outfit's detail from various angles. In the movie, Mr. Miyagi makes Daniel the gi for his birthday. As in the film, the bonsai logo is embroidered on the back of the gi. This outfit makes a perfect Halloween costume and it is especially useful when you are being bullied by a rival dojo's karate students. In addition to the Karate Kid Costume Gi above, browse the Karate Kid Clothing Gallery for more apparel like men's and women's clothes, kids shirts or hoodies.